The FPS 1000 series power supplies from Amtex Electronics is proving itself to be suitable in DC power solutions from 1000W - 3000W, both as a stand-alone solution or with more than one unit in parallel. With output current limiting protection as a constant current characteristic, the units are suitable for battery charging applications, as a DC UPS system, RF amplifier system or many other industrial applications. The FPS 1000 is an AC/DC power supply with universal input (85 – 264V AC), and with PFC, in a compact package with a height of only 1U/44mm. The 1kW modules are available with output voltage of 24V (21.5V - 29V range), 32V (28.8V - 38.8V) and 48V (43V - 58V). As a stand-alone power supply or battery charger, the FPS 1000 input is via an IEC socket and mains power cord. The FPS 1000’s DC load terminals are rated at 60 amps, and provide two +VE and two -VE terminals, therefore allowing anyone to connect to one’s load to one set of terminals and battery to the other set of terminals in a battery charging DC, UPS system. Front panel LEDs also provide visual indication for the above. One special feature of the design is that once the unit is mounted on a panel and hardwired, there is no need to disconnect the wiring should the power supply module need removal. A simple latch on the side allows for the module to simply slide in or out of its case that is permanently installed in the cubicle. This feature offers total flexibility for critical systems with a minimum downtime and supply. An example of how more than one unit can be used in parallel is as follows: a modular 1-3kW system using one. 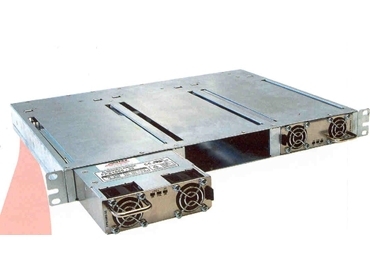 Two or three units in parallel or n+1 redundancy can be assembled in a low profile 1Ux19-inch rack mounting assembly. AC power connections can be via the front on IEC sockets, or rear IEC sockets. Again, all the relevant alarms are available on the rear panel connector and LEDs on front panel for visual indication. The FPS 1000 solution is highly suitable for powering critical 24V, 32V or 48V systems, with or without battery backup and with redundancy of modules. The modules are also plug-in style and there is no need to disconnect wires, etc., to remove or install the module in the system. The FPS 1000 type of assembly is suitable for wide a range of industrial applications, with international safety and EMC approvals.